owls about that then! : Cheap night out! Compared to previous years my monitoring of the local breeding owls has been some what subdued this year. There have been many contributing factors, or excuses depending on how you look at it but the biggest reason has been cost. My landrover returns a miserly 14 miles to the gallon and with the price of fuel recently I have to bit a bit more frugal when it is used. However, when I'm feeling a bit flush (which isn't that often!) a do chuck a few quid of diesel into it and get out there. 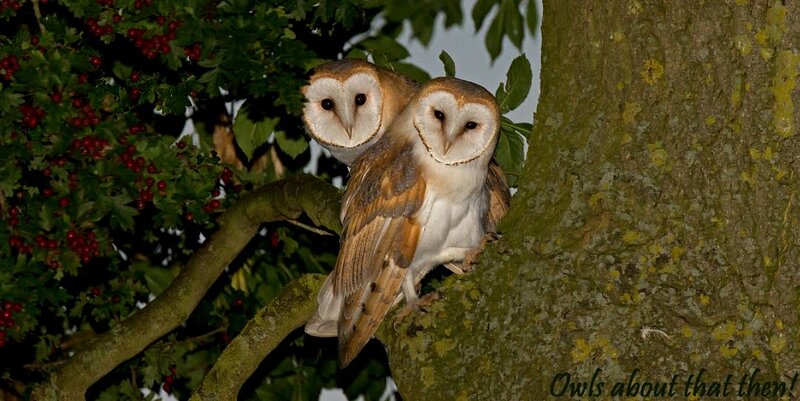 Last night was one of those more rare occasions as I wanted to go and check a few owl boxes for any signs of breeding. I wasn't sure which area and boxes I was going to check out, that was dependant on the latest price of the fuel and how far it would get me? As I pulled up onto the local garage forecourt there it was in massive neon lights........£1.41 a litre. That converts to whopping £6.27 a gallon, (sort it out Cameron) or in my case a sobering £0.48 per mile!!! So my £20.00 was going to give me approx 44.6 miles, and that was to get there and back! Needless to say I stayed very local, four different sites were checked out of which three showed no signs of any occupancy let alone any birds or breeding. But at the fourth and furthest site there was a positive result. I'd been there parked up underneath the nest tree when one of the adult birds showed at a hole entrance in the tree, below. This bird showing wasn't a surprise as at least one of them is seen on most visits, but had they bred? I do have a nest box here but they have never used it? However, successful breeding has been recorded over the previous 3 years but the natural nest hole goes too deep inside the tree and the chicks cannot be reached, consequently they are not ringed. Anyway, whilst watching the adult owl I got a real surprise, a juvenile poked its head out of the box! I was pleased that after 4 years they had eventually decided to use it, even though it is only 3 feet from the natural nest entrance! As you can see the box is on its last legs and is desperate for some maintenance. I don't think just a lick of paint will suffice though, a whole new box is required...........dam, more cash!!! So not a bad little excursion out, yet another site from 2012 with breeding success and another box in use, definitely a positive result. 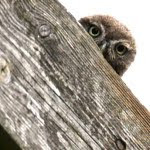 On the negative side I have to fund the cost of a replacement box, (£30.00) and whilst out I drove a total of 24.5 miles, (£11.76)........Not bad hey, £41.76 for an evenings owling!!!!!! Oil prices are just a joke. Great images though Paul. Yeh the kind of joke ya don't laugh at mate! The header is a stunner,let me know when your thinking of maintenance on the boxes mate? As soon as the breeding season is done mate......thanks!